The Whitehall Mansion Inn features five authentically decorated guest rooms that blend historic charm with modern hospitality. Relax in the luxurious, full-sized canopy bed with the cozy glow of the working fireplace. Indulge with a spa-inspired bath in the serenity of our beautifully restored New England Inn. Decorated with antique furnishings and hardwood floors, our rooms offer an intimate, 19-century feel, while outfitted with modern luxuries like free Wi-Fi. Wake each morning and enjoy a complimentary, full breakfast buffet at the Residence Inn Mystic, located next door. We also offer one ADA room to ensure the comfort of guests who require more room. Experience a Mystic landmark reinvented. 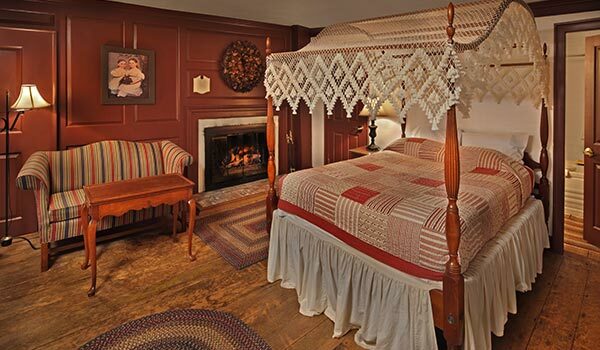 Experience the historical charm, tranquility and intimacy of our beautifully-appointed guest rooms with a working fireplace, antique accents and a four-posted canopy bed.